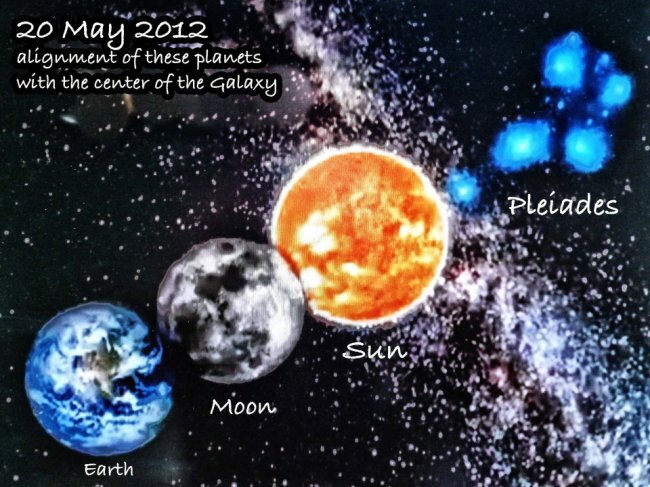 New Moon in Gemini + SOLAR ECLIPSE + Pleiades Alignment May 20th, 2012! Wow. May 20, 2012. This date/event was signaled out by the ancient Maya as a great cosmic event where the earth, sun, moon and Pleiades will aligned! Not only that but we will have a ring of fire Solar Eclipse and the New Moon in gemini! Powerful transformative forces at work. I gathered all the downloads so we can all tune in to this potent time! Â© Copyright 2012 â€“Â Miguel Angel Vergara.Â All Rights Reserved. Â© Copyright 2012 â€“Aluna Joy.Â All Rights Reserved. Â Â© Copyright 2012 â€“Patricia Liles.Â All Rights Reserved. The new moon and the sun will align with the pleiades…….which is in the constellation of taurus, the bull, not in gemini. Because of the earth’s wobble(precession of the equinoxes), it “appears” from our perspective to be lined up with Taurus. Using the tropical zodiac,it is lined up in Gemini. A note to RCRane, the Pleiades have not precessed into Gemini – fixed stars cannot precess into other fixed stars. Our PERSPECTIVE has precessed – one degree every 72 yrs to be exact. Yes, in Vedic astrology, it’s in Taurus, in accordance with the precession of the equinoxes. I never know anymore whether to even read western astrological reports, because they are inaccurate. But this is a fascinating page with lots of interesting perspectives, thank you . @LYNX the Pleiades have precessed into Gemini. At a new moon the sun and moon must be in the same sign, in this case both at 0 degrees of Gemini. Fabulous Mystic Mama – we are doing a SOlar Eclipse Event in London on Sunday with some amazing teachers to mark this special day. Alongside the astrological/Maya etc,.. research I did in preparation I came across this: – thought it may be of interest baring in mind the Pleaides are also known as the Seven Sisters – Maia (from which the Month of May we are now in) is the first of the stars. There are seven months almost to the day from the eclipse until 21.12.12 The Venus transit in June will last almost 7 hours. 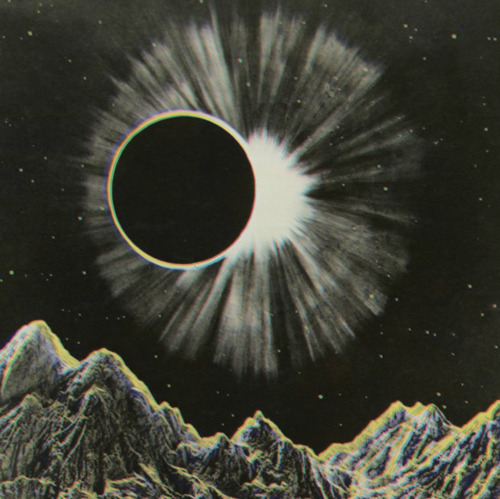 The Eclipse is in Gemini – with Venus in Retrograde. the mythology of the Pleaides is closely connected to Orion and could be seen as symbolic of the wounded masculine and wounded feminine. With Retrograde Venus in Gemini – the twins – sacred union/twin flames, the eclipse may darken the light for enough time to retrieve the shadow of our wounds to heal them through unity/ twin flame consciousness into the heart of the galaxy in the next seven months until the full moon expression once more in Gemini on 12th of December, the 12:12 gateway or portal in Time/Spac where the Earth will pass through a Full Moon alignment where the Full Moon will be in Gemini. Brilliant, wonderful additions yours are, to the article! Love that insight about the wounded feminine & masculine– feels spot on, as well as the sevens connections. Magic is afoot. woweee! yipeee! ill be here saying yes to it all! Thank you so much, Mystic Mama, for doing the homework for us and bringing it all together in one place! This was a great posting – very informative. I do have to say though, Lynx is right, technically. I am a Vedic Astrologer. Physically speaking – astronomically speaking – at the time of the eclipse, the conjunction of the planets (except Mercury) will all take place in the sign of Taurus, not Gemini. This in itself is major: The Sun, Moon, Jupiter, Venus, and the South Node will all be in the sign of Taurus together. The eclipse and the alignment with the Pleiades makes this potentially explosively transformative – very spiritually cleansing. A door will certainly be open, and energy, like rushing water, will come through. I can’t speak for the Pleiades, but to say that the planets have “precessed” into Gemini cannot mean that they are physically in the sign of Gemini, as they are not and will not be at the time of the eclipse. Tropical astrology is astronomically (physically) inaccurate, as it does not take into account the precession of the equinoxes. I have a friend who is an astronomer and who always marvels when he reads from tropical astrology sites online that, for example, the Moon is in Leo and he looks up and physically sees the Moon in the constellation of Cancer. However, (mystically!) both systems of astrology (Tropical and Sidereal) seem to work. Thank U 4 sharing these wonderful insight. Sarva Mangalam. Shanti OM! So happy we made it….Thank you all for the love in your hearts…this heart is overflowing with joy ,love and much gratatude for our creator….I wish all hearts could be at least as happy as i am…. The note by “James Tyberonn via Shift Frequency” was especially helpful to me, thanks for sharing. What would all of this mean to someone who has a birthday May 20? Tomorrow May 20 I will turn 51! I plan to go and sit by the lake and take advantage of the positive aspects of the shift! Suggestions? Carol, drink it in baby!!!!!! Happy Birthday and may the year ahead be spectacular for you. Resonating images, inspiring thoughts and heartfelt connection. Thanks for sharing. I am doing my first Shamanic Fire ceremony today. I feel so honoured that this very important event in my life was choosen for this most important Universal event. Thank you, Mystic Mamma! I so appreciate your research as well. This is awesome and I’ve shared on FB. With my sun in Gemini and a book project in full swing, your post confirms being in lovely flow. My son is going to born ay any moment. How this eclipse would affect him astrological speaking? Thank you for this! So interesting! Will we actually see anything in australia being it is in the day time. Yes! Connecting these infos now to what I am learning about Pleides, Mayan Cosmogenesis (book by Major John Jenkins) as well as ancient Stargate-knowing cultures, the Tantra path in Dravidian India and the Tuathaa de Danaan in Ireland. Both Tara-god/dess cultures. >>>>On May 20, 2012 was the big Symbiosis festival over here in west U.S.A. on Native land, Pyramid Lake, Nevada. It was amazing, and challenging of a fest, down-to-earth, and very cosmic, bringing together much intention and talent. Big prayers for our earth as we all aligned that day. >>>> Glad today to have connected that time and right now, weaving more understanding, and an even bigger, more cohesive view of my experience of this heralded year. Keep bringing the manna, Mystic Mamma. My and my friends love you. So humble and wise. ;) Bless! Thank You, Thank You, Thank You, Mystic Mamma for sharing this pertinent information.